Start your car when the battery goes dead, or run small appliances without needing to be plugged in to the grid, with the 200W Power Dome LT from Wagan. 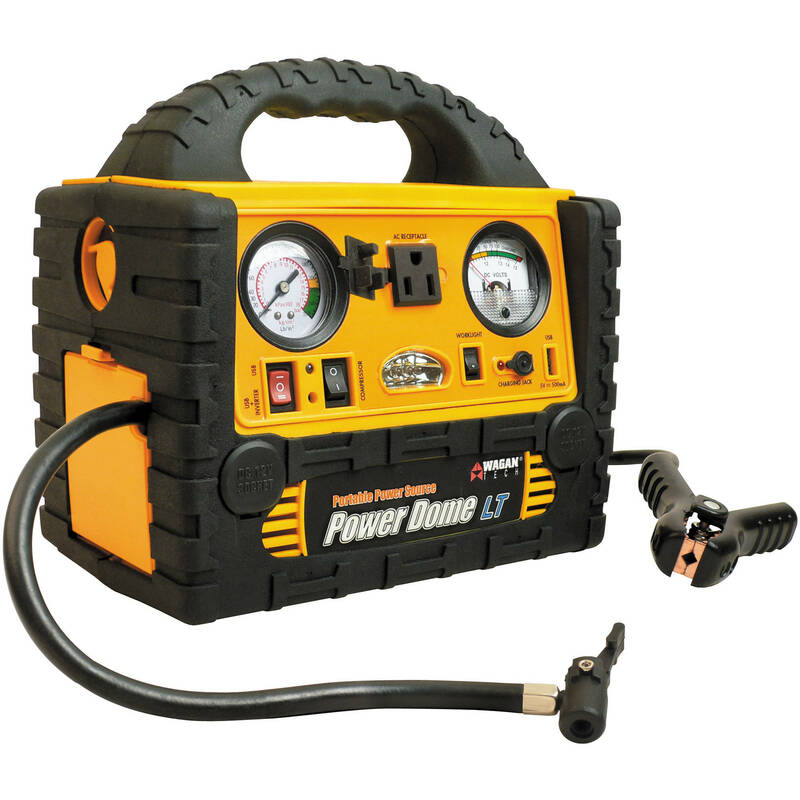 This device uses a built-in battery pack to power a 300 cranking amp jump starter, a 260 PSI air compressor, a 200W power inverter with outlet, and an LED work light. The jump starter has attached booster cables to get your car moving again when you leave the lights on by accident, and the compressor refills your flat tire so you can get to the service station. The inverter will run small AC-powered appliances, such as a laptop or a power tool's battery charger. There are also two DC sockets and a USB-compatible power outlet so that you can keep your favorite electronic devices running anywhere. The Power Dome LT can be recharged with your home's AC power or from your vehicle's DC cigarette lighter socket with the included adapters. It is recommended to fully charge 40 to 48 hours before initial use, after each use and every 2 to 3 months. Box Dimensions (LxWxH) 11.0 x 10.7 x 7.35"
Power Dome LT (200W) is rated 3.7 out of 5 by 3. Rated 5 out of 5 by Speed and Power from I love this handy piece of equipment I've had my jumper for almost 6 years, same battery, good power, holds a charge very well and very portable. I would recommend it to everyone. What AC appliances can this unit power? The WAGAN Power Dome LT will provide up to 200 watts of continuous power (300A Peak Amps). It is best to verify the specifications of the device being powered to ensure the power requirements are not higher.